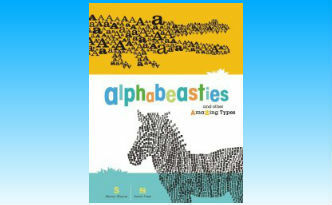 Alphabeasties and other Amazing Types by Sharon Werner and Sarah Forss. I’ll tell you straight out—I love the Alphabeasties book! He agreed with me that this book is a winner. Alphabeasties gives readers a bit of background material on typefaces and they do such a good job of it. They show the different typefaces such as BLOCKY just how you would expect them to look. Not only that, but their illustrations are charming and wonderful. I have a couple of pictures here to show you what I mean. A is for Alligator and it is made completely out of A text. Awesome! There are also some flaps to lift and other words for each letter. They don’t just list other words, oh no, they make a little “a” into an apple and and anchor and an acorn. I never thought much about typeface but I can see a lot of possibilities for using it in many art projects. I have never seen a book like this and I sincerely hope they continue writing publishing similar volumes. They came out with Bugs by the Numbers in 2011 and Alphasaurs and Other Prehistoric Types in 2012 along with flashcards, counting cards and the Alphabeasties Amazing Activity book. I checked on Blue Apple Books website but didn’t see anything forthcoming. One can hope! I thoroughly enjoyed this book and hope you and your boy will too. It is definitely worth spending some time with. I think I am going to have to buy it for myself! If you enjoyed this review you should check out our other book reviews for boys or our Alphabet Books for Older Readers Roundup. Plus, if you like animals and typography (and I just discovered I do!) you might also like this and this. Such a cool book! I may keep it for myself. And, how cool that you write about boys’ learning styles. With 4 boys, I’m always looking for info on understanding them. 2 are big readers and non-athletic, and the other 2 are just all your typical antsy boy. I signed up for your newsletter!